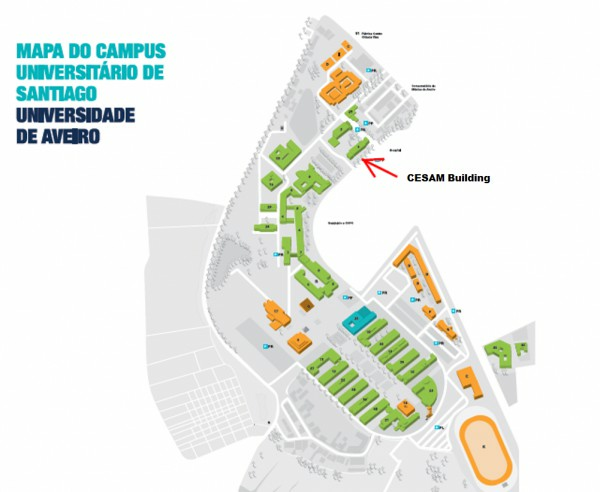 CESAM is located within the University of Aveiro campus and comprises 5 departments: Biology, Chemistry, Environment, Geosciences, and Physics. The technical and administrative services of CESAM are located on the 5th Floor of Building III - UA. 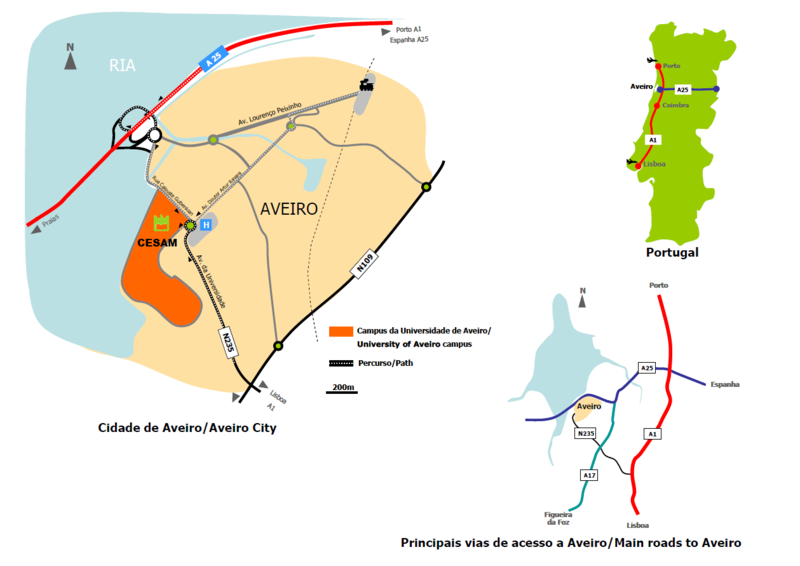 Location Maps HOW TO GET TO CESAM: By Car: The main roads to Aveiro are: A1 motorway - connects Lisbon to Porto, in the North-South direction. A25 motorway - connects Spain to Aveiro, crossing Portugal in the East-West direction. If you come from the North by the A1 motorway you take the exit Albergaria/Aveiro and then enter A25 motorway towards Aveiro. To reach the CESAM (Campus of the University of Aveiro) exit in Aveiro and at the roundabout take the second turn towards the Universidade de Aveiro. The University of Aveiro Campus is next to the hospital. You follow a similar path if you come from East on the A25 motorway. If you come from the South on the A1 motorway get out at the first exit to Aveiro (Aveiro Sul/Águeda) and enter the N235 national route, in the Aveiro direction, up to the city centre. At the first roundabout within the Aveiro city (second roundabout after leaving the A1) take the third exit and you enter in the Campus of the University of Aveiro. By Plane: The closest airport is Oporto airport, located some 80 km to the north of Aveiro. Lisbon airport is located 250 km to the south of Aveiro. If you are arriving from Lisbon airport (Portela Airport) catch the bus number 44 or take a taxi to the main train station - Estação do Oriente. Also, you can rent a car and enter A1 motorway towards Oporto. If you are arriving from Oporto airport (Francisco Sá Carneiro airport) you can take the Metro do Porto (line E) or a taxi to one of the train stations -Campanhã or S. Bento, or you can rent a car and enter A1 motorway, towards Lisbon. By Train: Aveiro is centrally located on Portugal's main railway line between Lisbon and Porto (CP, Comboios de Portugal), and the fast Alfa Pendular and Intercidades trains stop at Aveiro station. It is a 15 minute walk from the train station to the Campus of the University of Aveiro and 5 minute drive by taxi. It is also possible to catch a bus or a Buga (free service bike) to the Campus.